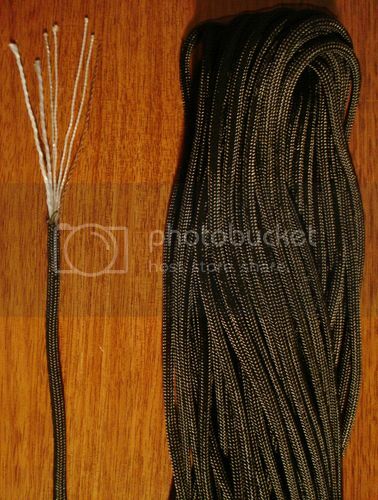 "We sell you (& have always sold you) 550 Paracord which is the commercial version of the mil-spec Mil-C-5040 cord. Your 100' & 50' coil label refers to it as "military style"- which is a common description, but can be mis-interpreted. We also make the mil-spec cord & make it to the military spec & sell most of that to the military. However, some of it is also sold in the commercial market. It also tests 550 lbs, but is made from more expensive yarns & therefore is a higher priced item. When we are selling either, we always clearly label it either 550 Cord or Mil-C-5040 Cord. This is a problem that is not limited to just us. This confusion is experienced by all of our competitors that make either of the cords too. The real shame is that not all of our competitors produce a quality commercial cord that tests 550 lbs. Some use inferior raw materials & just try to undersell everyone else." Great and fast customer service! !Great cord. The color of this cord don't show up right in the picture. Its a nice red and the pic makes it look almost pink. Trust me Its a good red color not faded looking... The outside nylon turns black easy when your melting the ends so don't hold fire directly on it. They could of made it easyier to pull out off the bag without bunching up. But as for the cord couldn't ask for much better any were. Great price on the cord but shipping is expensive so get a few packs. I will be ordering from this site and this cord again. The package got here before I even expected it. I ordered it early morning thursday and they sent it on friday and it got here monday! That was fast.<br>I looked at the product description and knew I could trust it, I was right. Price including shipping was a bad price. <br>I plan on making and selling paracord bracelets in the future.